Plant: Perennial herb; to 42 cm tall Leaves: petiolate; blades broadly ovate, 3.5-15 cm long, 2-9 cm wide, attenuate at base, acute at apex, sparsely pubescent, becoming glabrate, distinctly 3 (-5)-veined, the margins with a few shallow lobes near base INFLORESCENCE: pedunculate, scapose; PEDUNCLES 4-20 cm long, sparsely pubescent to glabrous, sometimes appearing ridged to four-sided. SPIKES 3-24 cm long, interrupted near base; bracts broadly ovate, 1.5-4.5 mm long, broad scarious-margined; midvein glabrous Flowers: perfect; sepals broadly ovate to elliptic, 1.2-2.3 mm long, broadly scarious-margined, midvein glabrous; corolla lobes spreading or reflexed, ovate, 0.7-1.5 mm long; stamens 4 Fruit: capsules, breaking well below middle; SEEDS 6-many, irregular in shape, ca. 1.0 mm long, ca. 0.5 mm wide, olive-green to dark brown, the outer surface furrowed Misc: weed of wet areas; 650-2500 m (2200-8200 ft.); May-Oct Notes: Bracts ovate and 2-4mm long.Only one terminal spike. References: Kearney & Peebles; Arizona Flora. McDougall; Seed plants of Northern Arizona. ASU specimans. Huisinga, Kristin D. and Tina J. Ayers. 1999. 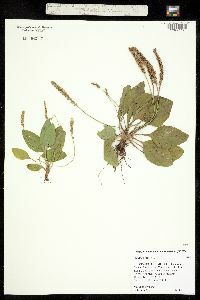 Plantaginaceae. Ariz. - Nev. Acad. Sci. 32(1). Perennial herb with fibrous roots flowering stem 5 - 25 cm tall Leaves: basal, thick-stalked, 4 - 18 cm long, 1.5 - 11 cm wide, broadly elliptic to broadly egg-shaped with an abruptly contracted base, more or less parallel-veined, strongly veined, sometimes irregularly toothed, thick, sometimes minutely hairy. Inflorescence: a narrow, dense spike of many flowers, arising from a leafless stalk (scape), 5 - 30 cm long, less than 1 cm wide. Flowers: stalkless or nearly stalkless, whitish, subtended by broadly egg-shaped bracts, not fragrant. Bracts 2 - 4 mm long, prominently keeled. Stamens four, exserted, alternate with corolla lobes. Style one. Sepals: four, green, 1.5 - 2 mm long, rounded to egg-shaped, scarious-margined (dry, thin, and membranous), with a rounded keel. Fruit: a dehiscent capsule (circumscissile), brown to purplish, 2.5 - 4 mm long, diamond- to egg-shaped. Seeds six to thirty, about 1 mm long, wrinkled, plump. Corolla: four-lobed, whitish, less than 1 mm long, scarious (dry, thin, membranous). Lobes becoming reflexed, about 1 mm long. Similar species: Plantago rugelii is similar but has purplish leafstalks and longer sepals (2.5 - 3 mm). Plantago media is also similar but has fragrant flowers and flat seeds. Habitat and ecology: Introduced from Eurasia. Frequent in waste ground and packed soil. Etymology: Plantago comes from the Latin word planta, meaning footprint. Major means larger. In moist or dry waste places. Rare in Indiana. It has been reported by many authors but I believe that most of the reports should be transferred to Plantago Rugelii, which without doubt occurs in every county of the state, although our early authors failed to report it. 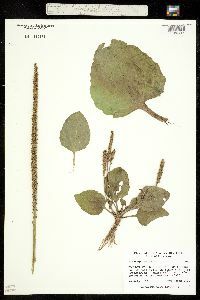 I collected an abnormal specimen of Plantago major on a knoll on the south side of the Pennsylvania Railroad about a quarter of a mile east of Winona Lake Station in Kosciusko County. It has five scapes and three of them have a whorl of leaves just below the spike. One spike has three leaves, one has five, and the third has six, the largest 5 cm long, but these are not in a whorl. All of my specimens of this species are more or less pubescent.